Ever felt down in the dumps, absolutely sure that you wanted to transform your life but no idea where to start? About three years back I stood at that intersection. I’d spent years earning one advanced degree after another, until I landed myself a job that paid well but the stress level was so high that I had little room for anything else. I’d married a wonderful guy whom I’d fallen crazily in love with, but our relationship had slowly, almost without our knowledge, spiraled downward until it seemed like all we felt toward each other was anger and disdain. After years of trying, we had a beautiful little girl, but she has such a strong-willed, determined personality that we clashed on a daily, sometimes hourly basis, and I was ready to pull my hair out. Every moment at home, someone was yelling, sulking, or seething. Except, I had no clue where to start. Or what to do. Or how to make the transformation that I so wanted. I started trying anything and everything. A few things stuck. Many didn’t. Slowly, a pattern started to emerge: Big, massive, overzealous changes almost always backfired and led to disillusionment and disappointment. Small, tiny shifts in attitude, on the other hand, had a huge cumulative impact. I still remember one period where I’d decided to not yell at my daughter, no matter what. I’d decided to become a positive parent and as such, be supportive all the time. If you’re a parent, you know how this is going to end. I managed to hold it in for all of three days or so. And then, suddenly, on some minor provocation, I let loose. All the dammed up irritation and frustration just came flooding out, while my daughter stared at me in utter shock and fear. This wasn’t how it was supposed to go! I actually felt worse now than earlier! I didn’t want to give up. So I kept trying. As one attempt after other failed, I got more and more disheartened. Finally, almost in desperation, I decided to focus on something else entirely—since I seemed incapable of not yelling, maybe, I thought, I can figure out why my daughter behaves a certain way and then try to prevent that situation altogether. The more I stepped into her shoes, the more I understood why she acted like she did. And the more I understood her reasons, the less I felt the need to yell. For instance, she wasn’t just defying me when she refused to wear a jacket—her toddler brain just couldn’t grasp that it was cold outside. So instead of asking her to wear the jacket while we were still at home, where it was warm and cozy, I’d wait until we got out and the cold draft hit her before asking her to wear the jacket. And most of the time, it worked! It was as if I had deciphered a secret code. Now, instead of trying to stop yelling, I started to make a conscious attempt to understand her a little more, and with each little effort, I was automatically yelling a little less. Quite without our knowledge, the relationship between my husband and me started to change, as well. I was suddenly snapping and yelling at him a whole lot less, too. And in turn, he started being kinder, gentler, and more the person I had fallen in love with. Even in the dog-eat-dog culture that was rampant at my then workplace, people responded with reciprocal kindness and goodwill. And I, in turn, found it a whole lot easier to be a better co-worker. It was a beautiful, virtuous circle. It’s been three years now. I’ve been focusing on making more and more of these small, tiny changes and they have been paying off big time. Our home is a whole lot more peaceful. We enjoy each other’s company a lot. My relationship with friends is richer. Life is good. I still have ways to go, but the change, the transformation that I was seeking, is happening. Toward the end of last year, in a moment of quiet reflection, I listed some of the small shifts in attitude that have helped me so, and others that I seek to practice in the New Year. I’m sharing them with you here in the hopes that they may help you make the transformation you might be seeking. When we can understand why the other person acts the way they do—whether they are three years old or thirty—the need to yell automatically starts to diminish. When we look at all the wonderful things in life, the things that don’t go well start to seem trivial. When we get hurt, it is instinctive to want to make the other person “pay,” but if we can guide the person to fix the situation, things are more likely to get better sooner. We are all unique, different, and a wee bit crazy in our own way. 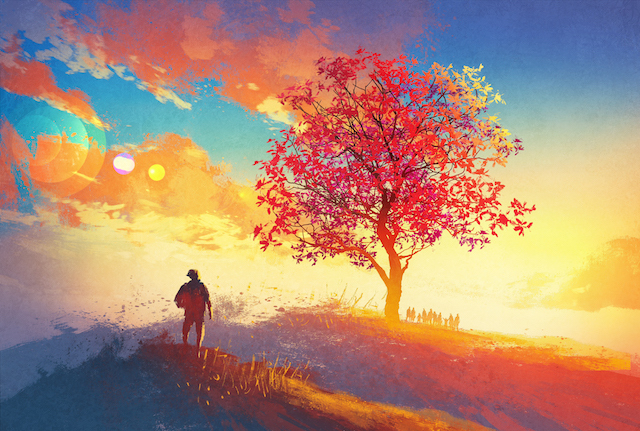 The best way to counter the urge to be judgmental is to cultivate a sense of wonder at each person’s uniqueness. The more we resist something, the more it persists. The more we accept it, the less it bothers us. Shame is a deep-seated fear that we are not enough. Yet, it’s a fact that none of us is perfect. When we accept the imperfection and embrace it, the tight grip of shame starts to loosen up. We cannot reason with fear, especially the irrational one that stays in the head. The best way to make change happen is to take action and keep moving forward. Our life seems like a drag when we compare our “behind-the-scenes” with the highlight reel of someone else’s life. Focusing on contentment kills the need to try to keep up with the Joneses. It’s scientifically proven that we have a limited supply of will power, and the more we exert it, the less we have for future use. So whenever possible, turn things into habit, limiting the need to use will power. We all make mistakes. Communicating how badly we feel and figuring out how to fix things will keep guilt from gnawing away at our happiness. Embrace all shades between black or white, and the need to obsess on the extremes starts to shrink. Particularly helpful for recovering perfectionists like me! Come at things from a place of abundance and seek intentionally to cooperate, and the fear of competition starts to melt right away. If there is one thing we can learn from kids, it is to have fun. Ever notice how few kids are actually stressed? Finding joy in giving is the perfect antidote for a case of the gimmes. Seriously, make getting a fixed number of hours of sleep each night a priority, and distractions like social media and television will automatically stop killing productivity. Bitterness only hurts the person carrying it. Forgive those who hurt us and move on. Some things are simply out of our control. Learning to go with the flow helps tone down the urge to control. What if we are wrong some times? Being open to accepting failure and constantly learning makes life so much simpler and beautiful. Start small by delaying gratification with little things. As we learn to be more patient, our expectations of how/when things should turn out start to relax as well. Easier said than done, but the more easily we can say “sorry” and “thank you” (and really mean it), the less hold ego has on our life. What has your experience been? Have you also experienced that small, tiny shifts in attitude can result in huge transformations? What are some of the small changes you’ve made that have resulted in a life overhaul?